Refreshes, wakens and deeply cleanses the face without over-drying skin. Excess oil, impurities and skin debris are removed with our advanced natural technologies leaving all necessary moisture where it belongs - in your skin. Formulated with willow bark, green tea and spinach the rich gel has anti-oxidant, anti-septic and anti-inflammatory properties to protect and defend skin cells. 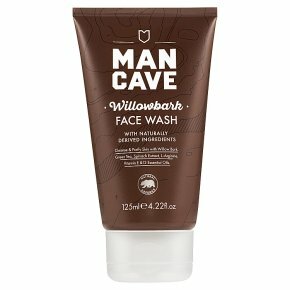 Vegan friendly & cruelty free certified.The ManCave FaceWash captures that moment of clarity as the Huntsman takes a momentary rest from his pursuit to bathe his face in the mountain spring, removing the sweat and fatigue from his morning's exertions. The high concentrate natural FaceWash has been developed to refresh and deeply-cleanse without over-drying your skin. Excess oil, impurities and skin debris are removed with our advanced natural technologies leaving all necessary moisture where it belongs - in your skin. Formulated with Willow Bark, Green Tea and Spinach the rich gel has anti-oxidant, anti-septic and anti-inflammatory properties to protect and defend skin cells. Our precise combination of natural extracts work to refresh, waken and purify the skin for a fresher and healthier appearance. Naturally Cleanse and Purity your Skin with Willow Bark, Green Tea, Spinach Extract, L-Arginine, Vitamin E and 12 Essential Oils. This product does not contain; parabens, sulphates (SLS SLES), synthetic dye, petrolatum, mineral oils, ingredients from animal sources and is not tested on animals. Directions Massage onto wet skin, then gently rinse with clean water.